Or the inclusion of plantain. Whatever it is, this salad hits all the right spots. It's crunchy, slightly tart, sweet, savoury, and incredibly filling. I've peeled the carrots with my good ol' julienne peeler (remember this recipe?). You can get yours here too (in the 'kitchen' section). To make the dressing, combine the lemon juice, maggi seasoning, olive oil and dried thyme in a small bowl and whisk with a fork. Pour over the salad and mix well. Peel and slice the plantain diagonally. You have two options on how to cook the plantain. For a leaner dish, grill the slices, turning them over to brown on both sides. Alternatively, you can make traditional fried plantain by frying the slices in a little sunflower oil, turning over to brown both sides. Remember to drain the excess oil on some kitchen paper. 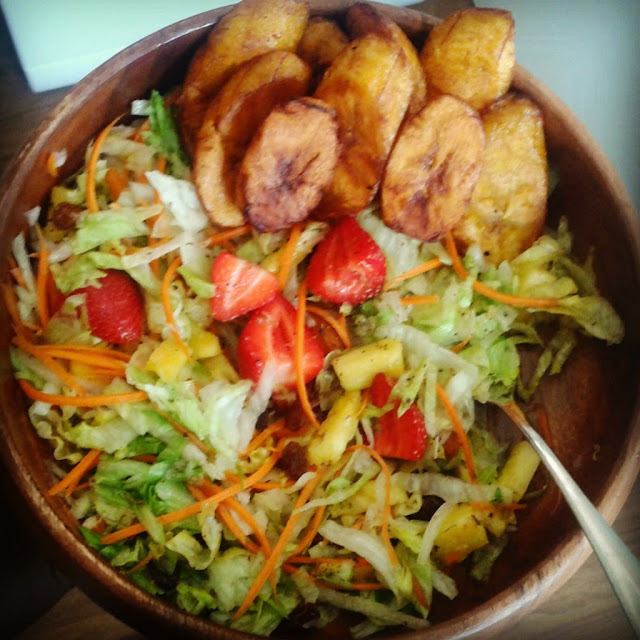 Serve the salad with the plantain. Enjoy a filling, wholesome lunch or dinner. Easy to make!! Love this!! I am bookmarking all these recipes. I sooo need a kitchen! !